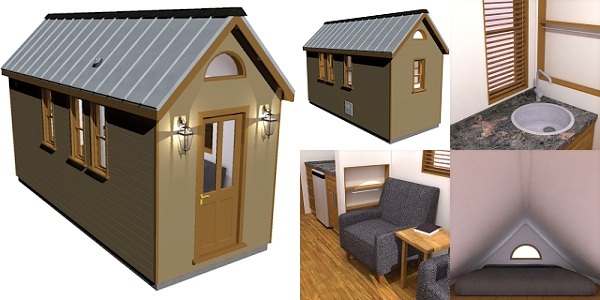 The PB-63 is another of our mid-range tiny houses. The roof pitch in this home is reduced to increase space in the loft. At 16′ long by 7′ wide, the PB-63 is one of our mid-range models. The gable-end entrance leads directly into the living area, which is bathed in light due to 4 large windows (6 if you include the glazed door and loft window). The living area has ample space for a minimum of two armchairs and a cosy table, which directly face the gas heater and windows. The entrance to the kitchen is flanked by two large closet/shelving units for storage. The kitchen itself is relatively modest yet functional, with all the basic essentials such as cupboards, sink, cook-top, refrigerator and built-in storage for smaller items like cutlery, herbs and spices. The PB-63′s bathroom is the smallest width bathroom we feature in our homes – 2 feet wide! Despite its size it contains enough space for a shower, toilet, mirror and built-in shelving. The loft easily accommodates a queen size mattress, and is naturally lit during the day by its half-round window.